That said, there’s some cartoons that convey an environmentally friendly message (or feature the subject of ecology) without coming off as forced or mocking. This 1976 “Peanuts” special features the gang preparing for Arbor Day by… turning Charlie Brown’s baseball field into a garden, complete with scarecrows in the outfield, etc. This special’s often cited as one of the odder ones in the run, since it’s dedicated to a holiday that was already growing obscure by the 1970s. The special is included as an extra on the recent DVD versions of “It’s the Easter Beagle, Charlie Brown.” It’s also included in the “Peanuts: 1970s Collection, volume 2” box set. The classic Dr. Seuss book about environmental wastefulness received a 1972 animated TV special. One interesting aspect in the special is a scene where the Once-Ler notes shutting down his factory will put hundreds of people out of work. The Lorax admits he doesn’t have an easy answer for that. 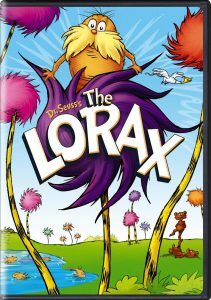 “The Lorax” received an animated treatment again, this time in a 2012 CGI animated feature where Danny DeVito voices the Lorax. This one took quite a few liberties with the original book, however—the Once-Ler is a visible character, for starters. There’s also the controversy its advertising campaign raised, including questionable merchandising tie-ins with disposable diapers and an SUV. Patrick McDonnell’s comic strip “Mutts” often focuses year-round on topics such as ecology. It also delves into issues such as adopting pets from a shelter. The strip’s animal adoption aspects reflect McDonnell’s real life involvement in such efforts. McDonnell’s also a vegetarian. However, a butcher’s shop in the strip (the “Fatty Snax Deli”) is a regular “haunt” for Earl and Mooch. “Dinosaur Train“‘s main concern is, of course, teaching basic facts about dinosaurs. However, there’s also a strong emphasis on nature and the outdoors. Within the show, Buddy the Tyrannosaurus rex and his Pteranodon siblings have formed a “nature trackers” club for such a purpose. Meanwhile, the live-action segments often have the show’s resident paleontologist “Dr. Scott” urge viewers to get outside and enjoy nature. Dr. Scott Sampson’s own blog/Twitter feed places an even heavier emphasis on nature/the environment, when not discussing paleontology issues, of course. Despite the above criticisms of “Captain Planet,” I did watch this show when I was younger. Yes, it could be clunky at times in how it handled environmental issues, or issues like drug abuse. (As well meaning as the drug abuse episode was, my siblings and I mocked its more over-the-top parts.) Still, it’s one of the first animated TV shows to address environmental issues. It’s also one of the few cartoons produced during the Cold War to present Russian characters in a flattering light. Another unique aspect is “Captain Planet” is one of the few cartoons (or American TV shows period) with Black Africans (versus African-Americans) as main characters. 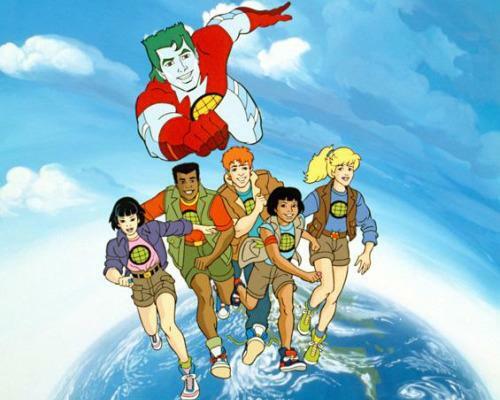 Boomerang usually airs a marathon of “Captain Planet” episodes every year on Earth Day. “Nature Cat” is a PBS animated series that debuted in 2016. It features the adventures of a quartet of animal characters who enjoy the outdoors: Nature Cat, a boisterous house cat who ventures outside when “his family’s away for the day”; Hal, a ditzy but nice dog; Daisy, a rabbit who carries a smartphone; and Squeeks, a somewhat snarky but kind mouse. An Earth Day episode was produced; it centered around the gang trying to stop grocery store plastic bags from polluting the environment (an actual ecological concern in real life).